It’s an everyday tabletop vignette in the South. A glass of sweet tea glistens with condensation, and groupings of hot pepper vinegar, Tabasco sauce, ketchup, salt, pepper and butter stand ready to enhance the flavors spread across a plastic tray. Those traditional offerings often include a miniature bowl of chopped collards in piping hot pot liquor, a side of savory black-eyed peas, ultra-creamy baked mac and cheese, crispy, buttermilk fried chicken and the complimentary, buttery dinner roll or crusty cornbread. No pretenses, just the classic meat-and-three fare like grandma used to make. This soul-nourishing cuisine is an essential element of the culinary fabric below the Mason-Dixon Line. It’s the wafer that christens you a true Southerner, and, religiously, generations have lined up to receive this down-home cooking. Regardless of race, age or income, there’s no dividing line when it comes to the meat-and-three queue. Maybe that’s why they call it soul food. Souls of many stripes come together, to the tables, where titles and stations are squarely eclipsed by the humble and divine Southern supper. Birmingham’s meat-and-threes include longstanding institutions staunchly loyal to the old-school culinary approach, as well as hip, new joints that playfully invent new-school twists to the old classics. Let’s visit five of Birmingham’s meat-and-three eateries that are sure to make your mouth water for some down-home cooking! Although Tim majored in psychology at Ole Miss with a minor in English and German, his epicurean savvy comes from his insatiable curiosity and the discipline of growing up in the Greek-run restaurant business. He learned the traditional Greek recipes standing beside his mother and aunt in the home kitchen, and learned the inner workings of a restaurant from working in his father’s restaurant. Later, the self-taught chef traveled and apprenticed under well-known chefs across the country, most notably his good friend, John Currence. “I learned the hard way, from working 80 to 95 hours a week in the kitchen, and I pulled everything that they all taught me together,” says Tim, who uses his diverse training to handle the standard meat-and-three fare. He infuses each dish with a creative finesse that maintains the integrity of the well-loved Southern staples, while taking them to the next level. Chef Tim Hontzas fillets fresh Gulf snapper. Chef Tim checks in with some regular customers. “I’m fiercely loyal to my vegetable farmer, Dwight Hamm,” says Tim. “He brings me the jalapeños, and I bottle them and pickle them per his grandma’s recipe.” Look out for their own homemade versions of Tabasco and Crystal hot sauces. “You’ll see him at Pepper Place, full-blown overalls and Coke bottle glasses. He’s old-school. He’s collards, squash, turnips and watermelons and ‘okrey,’” says Tim of his farmer friend. The old-school-meets-new-school duo makes their own pepper sauce from Farmer Hamm’s grandma’s recipe. It’s a classic with a kick, just like Johnny’s Restaurant. This Irondale hot spot opened as a humble hot dog stand in 1928. It was a charming, small building with wooden plank floors that sprang with your step. Miss Bess Fortenberry bought the tiny eatery in 1932, dubbing it the Irondale Cafe. Free-spirited Bess was Fried Green Tomatoes’ author Fannie Flagg’s aunt, and may have provided the inspiration for the novel’s main character with a rebel heart, Idgie Threadgoode. Miss Bess, the ahead-of-her-time local business owner, joined the war effort in Florida in the ’40s and returned to Irondale with two friends in tow, Sue Lovelace and Lizzie Cunningham. For the next 20 years, the trio of independent ladies — Bess, Sue and Lizzie — ran the Irondale Cafe with such a contagious charisma that it became a wildly popular lunch spot for miles around. Billy McMichael, a loyal regular and adoring fan of Miss Bess, bought the cafe in 1973, after Miss Bess had been looking for a fitting new owner to take over the business. 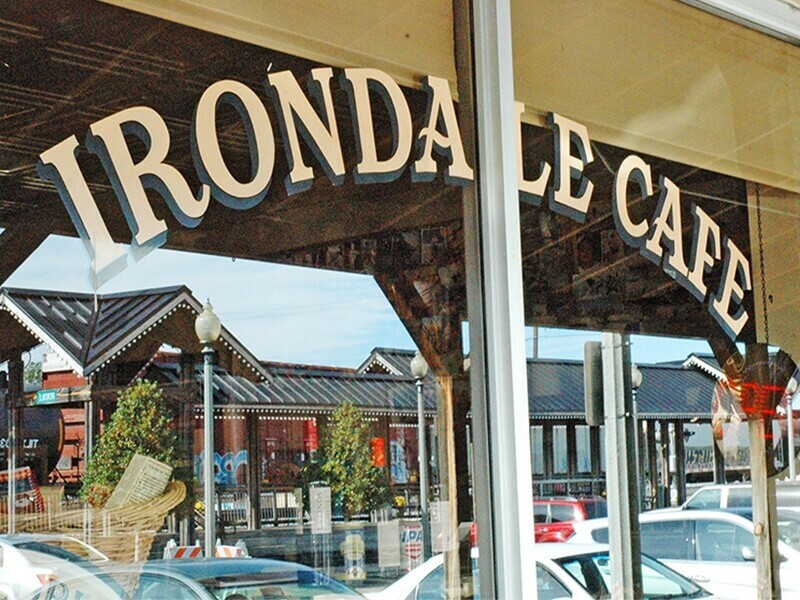 “Most of our employees have been here for five to 10 years, and many customers have been coming here their entire lives,” says Jim Dolan, current owner of the Irondale Cafe. “While many people know us from the movie, most of our customers are regulars who keep coming back for the Southern, home-cooked food. The fried chicken, fried green tomatoes, mac and cheese, and cornbread dressing with giblet gravy are most popular.” Due in large part to the movie, the cafe cooks up about 60 to 70 pounds of its delicious fried green tomatoes each weekday, and more than that on Sundays. 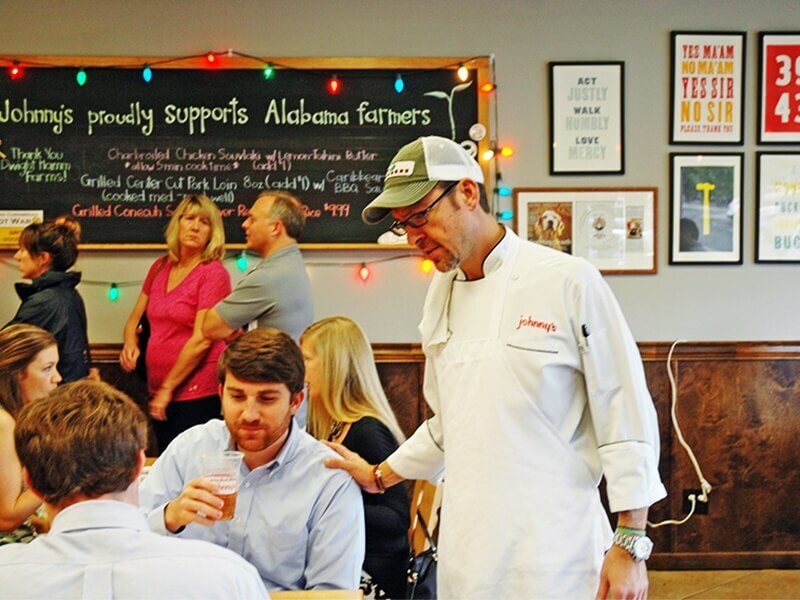 The Irondale Cafe has since expanded from the tiny eatery into a spacious 100-seat cafe, and they just opened a new location, aptly named Fried Green Tomatoes, in Hoover. The movie poster of Fried Green Tomatoes hangs proudly on the restaurant wall. The “original Whistlestop Cafe” still sits directly across from the railroad tracks. Is there anything more Southern than a tray of smothered chicken livers, fried green tomatoes, collard greens, squash, buttermilk pie and a nice, cold iced tea? Ted’s is a downtown favorite, where construction workers and attorneys rub elbows with academics and grandmas. This white tablecloth restaurant, situated along a picturesque side street in Mountain Brook Village, has been serving creative American cuisine since 2000. “We were fine dining, dinner only, until about six years ago, when we decided to open for lunch with a different concept: upscale meat-and-three,” says Debbie McKinstry, office manager and special events coordinator at Daniel George. The meat-and-three lunch menu includes Gulf Coast seafood, wild and domestic game and, of course, fresh local produce, with subtle global influences that elevate the classic Southern flavors. The boneless fried chicken with sawmill gravy and the crab cake vie for the most popular main dish, while the caramelized Brussels sprouts, roasted fingerling potatoes and andouille maque choux remain the favorite sides. We dare you to taste only a nibble of the fresh cheddar cheese biscuits, and then refrain from inhaling every flaky, buttery, savory morsel. And, if you’re feeling especially decadent, try the exquisite creme brûlée. The atmosphere of understated elegance is a rarity in the meat-and-three world, and spacious and light-filled dining rooms are a refreshing change of pace when paired with scrumptious Southern cuisine. So if you are looking for down-home cooking in an upscale setting, Daniel George fits the bill with culinary panache. A vegetable plate features spicy pineapple collard greens, pole beans with tomato and basil, Mardi Gras slaw and roasted fingerling potatoes with a cheddar cheese biscuit. Daniel George also has a terrific spicy seafood gumbo over rice. A tiled mosaic of the Daniel George logo greets you at the front entry of this upscale meat-and-three eatery. “We cut our own steaks. We do fresh seafood, snapper or grouper, Greek-style, with olive oil, lemon juice, oregano and garlic,” says Pete Hontzas, co-owner of Niki’s West and cousin of aforementioned Chef Tim Hontzas of Johnny’s Restaurant. “It’s simple, but effective. We’re straightforward with our food, and we’re straightforward people. We don’t do any of those fancy sauces. We’re very old-fashioned, even the decor. It’s kind of our niche. We have old-fashioned beliefs and old-fashioned ways. We try to keep the basic principles alive.” Those principles started with Hontzas’ great aunt, who started Niki’s Cafe in 1951, with locations downtown and on Finley Avenue for close proximity to the farmers markets. Hontzas’ father came to Birmingham from Greece when he was 18, and eventually bought the Finley Avenue location, adding “West” to the title to set it apart from the downtown cafe. Nowadays, Pete and his brother, Teddy, are keeping the family business alive. Vintage menus from Niki’s Cafe, where Pete and Teddy Hontzas’ father worked as a young man. Tomato-cucumber salad, fried okra, collard greens and cornbread are finished off nicely with sweet tea. The crew at Niki’s West gets ready for the crowds to arrive. Shake a little pepper sauce on your collards for a quintessential taste of the South. So whether you’re visiting “Collard Leaf” at Johnny’s, chowing down on the famous fried green tomatoes at the Irondale Cafe, enjoying upscale Southern soul cuisine at Daniel George or joining the melting pot at Niki’s West or Ted’s, Birmingham’s meat-and-threes have something for you! Keep up with other tasty local eats on the SB Birmingham Instagram feed.